When it comes to your injury or workers' compensation case, don't settle for less! If you have been injured in an accident, you need a personal injury lawyer that can provide comfort to you while ensuring that your questions are answered and your legal needs are met. At DiLoreto, Cosentino & Bolinger, P.C., we will advocate for you, while being straightforward with insurance companies and aggressive with lawsuit defendants. Our lawyers have over 100 years of combined legal experience fighting for the rights of Chambersburg and Franklin County residents injured in accidents including motor vehicle and truck accidents, drunken driving accidents, and in cases involving product liability and wrongful death. Members of our firm have been honored with awards including: Super Lawyers 2011, National Trial Lawyers Top 100 Trial Lawyers, Million Dollar Advocates Forum and Multi-Million Dollar Advocates Forum, which is limited to lawyers who have obtained verdicts or settlements of more than a million dollars for clients. 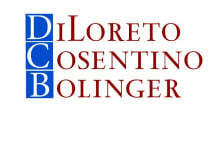 At DiLoreto, Cosentino & Bolinger, P.C., we have a strong record of success. We offer the resources and knowledge that you would expect at a larger firm with the local feel and personal attention of a smaller community firm. We offer a free case evaluation and consultation where we can assess your case and provide you with options. We also offer off-site visits to your home, or the hospital. We are conveniently located next to the Chambersburg Post Office, on Lincoln Way East in Chambersburg, Pennsylvania.